The National Juvenile Information Sharing Institute’s Governance Guidelines for Juvenile Information Sharing (NJISI) were prepared by ACG, Inc and the Center for Network Development in 2011. The NJISI Governance Guidelines are based on the original Guidelines for Juvenile Information Sharing (JIS) published by the CND in 2006. The NJISI guidelines draw on the experience and expertise of those who work in youth-serving agencies and information technology initiatives throughout the United States. The NJISI Guidelines were validated by several statewide collaborative focused on improving outcomes for children, youth and families and provide a course of action for key agency and organization stakeholders involved in efforts to successfully implement and sustain juvenile information sharing. A downloadable version is under development and will be available in e-book format in late 2014, early 2015. Check back soon. of 2010 and 2011. The outcome of these interviews have been compiled and placed in this report. The family and youth perspective radiates throughout the report and provides us with recommendations and insight on how families and youth in crisis expect to be treated and how they expect their information to be shared. To download a printable version, click here. “Information sharing” is usually associated with technology. The sharing of inform ai ton is defined as the process of exchanging data among various agencies' or organizations' through computer systems and, the information can be located almost anywhere - even in a cloud. 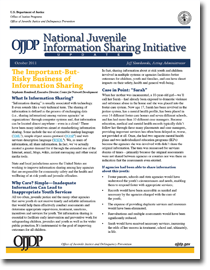 A federal initiative – called the National Juvenile Information Sharing Initiative (NJISI) – sponsored by the Office of Juvenile Justice and Delinquency Prevention(OJJDP) and managed by the Center for Network Development(CND) is a training and technical assistance project designed to build state and local jurisdictions’ capacity to plan and successfully implement information sharing through standardized, proven practices and policies through guidelines developed specifically for at risk youth and juvenile justice agencies. To download a printable version, click here. Stephanie Rondenell, Executive Director, Center for Network Development, Christine Duclos, Ph.D.
and the National Information Exchange Model - NIEM. The results also ascertained challenges to implementation, such as training, access to needed resources, and collaboration between local communities and the JISI program as a whole. To download a printable version of this article, click here. In 1992, Jefferson County, Colorado, experienced an increase in youth violence that led to a rise in juvenile arrests and filings. This juvenile activity had a negative impact on the juvenile justice system, since it lengthened time from police contact to a court appearance.